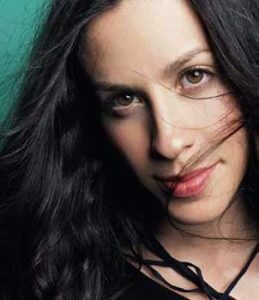 Alanis Morissette is a Canadian-American singer, songwriter and actress. She is best known for her international debut album “Jagged Little Pill”, which sold more than 33 million units globally, and became the best-selling debut album in music history. Her fifth studio album “Under Rug Swept”, released on 26 February 2002, included 13 new songs and topped the Billboard 200 chart. Morissette is the recipient of several accolades, including seven Grammy Awards and sixteen Juno Awards. Her best known hits include “Everything,” “Thank U,” “Hand In My Pocket,” “UR,” “So Pure,” “Head Over Feet,” “You Learn,” “Uninvited,” “Ironic,” and “You Oughta Know”. Born Alanis Nadine Morissette on June 1, 1974 in Ottawa, Ontario, Canada, her father, Alan Richard Morissette, is French-Canadian, and her mother, Georgia Mary Ann, is from Hungary. She has an older brother named Chad, and a twin brother named Wade. She started learning piano at the age of six and wrote her first songs at 9. She was educated at Holy Family Catholic School, Immaculata High School, and Glebe Collegiate Institute in Ottawa, Ontario. She released her first demo in 1985. In 1986, she had her first stint as an actor: 5 episodes of the long-running series, You Can’t Do That on Television. She has been married to Mario Treadway (Souleye) since 2010. Together they have two children. *She was born on June 1, 1974 in Ottawa, Canada. *She was raised in a devout Roman Catholic family, but now practices Buddhism. *She began taking piano lessons at age six. *She has dual citizenship of Canadian and American. *On 11 February 2005, she became a U.S. citizen. *Ave Maria is her favorite song. *She ranked #53 on VH1’s 100 Greatest Women of Rock N Roll. *She was engaged to Canadian actor Ryan Reynolds from 2004 to 2006. *Follow her on Twitter, YouTube, Myspace, Facebook and Instagram.